Can Pet Mice Eat Toilet Paper? Pet mice are social creatures that enjoy playing with each other when they're not sleeping in their nests. Mice make their nests out of any soft material available, and toilet paper is softer than other options, such as shredded paper or hardwood shavings. They like to shred nest items themselves, which means sometimes they eat some of it. Mice tend to shred soft items. such as paper, tissue and light fabrics. to make soft, comfy nests for themselves. They also might gnaw on and shred cardboard toys and hidey holes you place in their cage, such as tissue boxes and toilet paper rolls. Their front teeth never stop growing, and the mice must gnaw to keep the teeth filed down. They need to chew on hard objects, such as dog biscuits, to shorten the teeth, but the instinct to gnaw and shred extends to soft items as well. Mice usually stick to the tasty food you provide to satisfy their hunger, but that doesn't mean nothing else goes in their tummies. As they shred the soft toilet paper you give them for their nests, they can eat some of it unintentionally. Although toilet paper isn't part of a healthy mouse diet, a small amount shouldn't hurt your mouse; the toilet paper usually dissolves quickly and easily or is passed by the mouse without problems. If your mouse decides to eat more of the shredded toilet paper than he leaves for his nest, he can wind up with an intestinal blockage. It's not common with toilet paper, but it can happen. If you haven't had to clean up much mouse poop in a day or so, check his belly. It might feel hard or distended if there's a blockage. Your mouse also might be lethargic, or refuse to eat or drink. Take him to the vet immediately if you suspect he's eaten too much toilet paper. Toilet paper isn't the only problem in a mouse's cage. Using fluffy cotton wool that's sold commercially for mouse bedding can be a bigger problem than toilet paper because it doesn't dissolve the same way. Even eating a small amount of the cotton can cause intestinal issues. If you don't have an issue with your mouse eating what it shreds, toilet paper still can cause health issues if you don't clean it out daily. It absorbs the mouse's waste, harboring bacteria and getting stinky quickly if not removed. What Kind of Wood Shavings Are Best for Chinchillas? Can Hay Be Used in Guinea Pig Cages? Can You Use Cedar in a Mice Cage? How Can You Tell When Rabbits Are Sick? What Kind of Bedding Do Mice Prefer? How Can I Deodorize a Rabbit Cage? 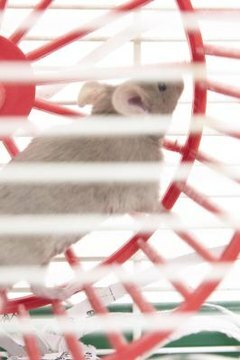 What Bedding Should You Put in a Gerbil's Cage? How Often Do Wild Mice Need to Eat?